Craft For A Cause to help Madra Rua! 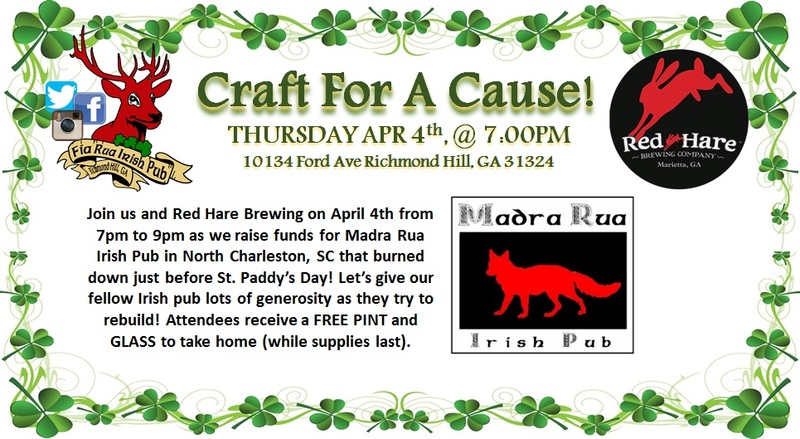 Join us and Red Hare Brewing on April 4th from 7pm to 9pm as we raise funds for Madra Rua Irish Pub in North Charleston, SC that burned down just before St. Paddy’s Day! Let’s give our fellow Irish pub lots of generosity as they try to rebuild! Attendees receive a FREE PINT and GLASS to take home (while supplies last). LIVE MUSIC will also be on hand!